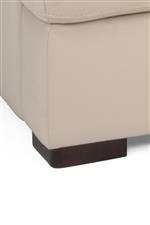 The Latitudes- Dowd Contemporary Ottoman by Flexsteel at Conlin's Furniture in the Montana, North Dakota, South Dakota, Minnesota, and Wyoming area. Product availability may vary. Contact us for the most current availability on this product. Padding & Ergonomics This cushion consists of a moderately firm polyurethane foam core wrapped with a layer of polyurethane recovery foam and a soft fiber top. 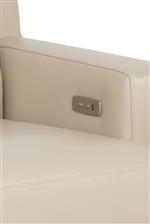 Technology is working to keep you comfortable with this collection of power living room furniture. 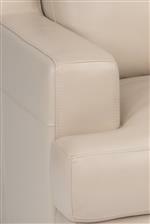 Your family and guests won't want to get off these pieces that feature adjustable seat backs and luxury cushions. When you tell them they can plug their phone right into the USB port on the power mechanism, they'll want to go buy these pieces for themselves. The Latitudes- Dowd collection is a great option if you are looking for furniture in the Montana, North Dakota, South Dakota, Minnesota, and Wyoming area. Browse other items in the Latitudes- Dowd collection from Conlin's Furniture in the Montana, North Dakota, South Dakota, Minnesota, and Wyoming area.